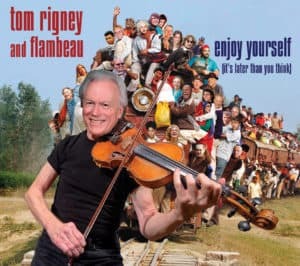 The long-awaited new Tom Rigney and Flambeau CD, Happy to Be Here, hits the street on June 15 and it’s guaranteed to light up the neighborhood. The new disc features twelve great Flambeau tracks, including many of the most-requested tunes in the live repertoire. The album is a fine showcase for all the members of Flambeau (in its various guises), with stellar performances by Caroline Dahl (piano/accordion), guitarists Danny Caron, Jerry Cortez, and Denny Geyer, drummers Jimmy Sanchez and Ian Hoffman, and bassists Steve Parks, Pat Campbell, and Steve Evans. In addition to these players there are guest appearances by Lloyd Meadows (Zydeco Flames) on rub board, Vince Littleton (Super Diamond) on percussion, Catherine Matovich (Neil Diamond) on violin, and Jim Nunally (John Reischman and the Jaybirds) on acoustic guitar. The repertoire is a scorching blend of Cajun, zydeco, blues, and New Orleans dance grooves, and includes several new Tom Rigney originals: Party Gras (a smoking New Orleans groove destined to be the dance party hit of the summer), Annie’s Reel (an irresitibly infectious fiddle tune written for his daughter), and The Firefly Waltz. But the new disc also contains killer versions of a number of big Flambeau hits: Maman Rosin (a powerhouse Mardi Gras tune), Boppin’ the Blues (the Carl Perkins classic), Jambalaya, Milk Cow Blues, and even Tom Rigney’s legendary (and long-awaited) version of the fiddle classic, Orange Blossom Special. 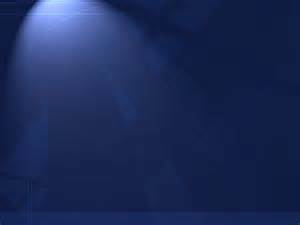 Once that little laser beam hits the first track you won’t be able to stand still, so clear out some room, invite a few friends over, and get the party started! 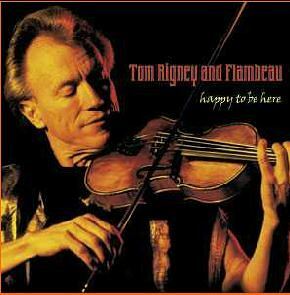 Tom Rigney and Flambeau are HAPPY TO BE HERE!